New York City was on my Bucket List, just like I'm sure it is for so many people. My Aunty Ann told me before I left, that it was one of her favourite cities in the word. She's been travelling the world my whole life, so to say this made it a big deal. It took about 4 hours from getting off the plane, for me to fall in love. Finally I could understand the t-shirts and handbags. 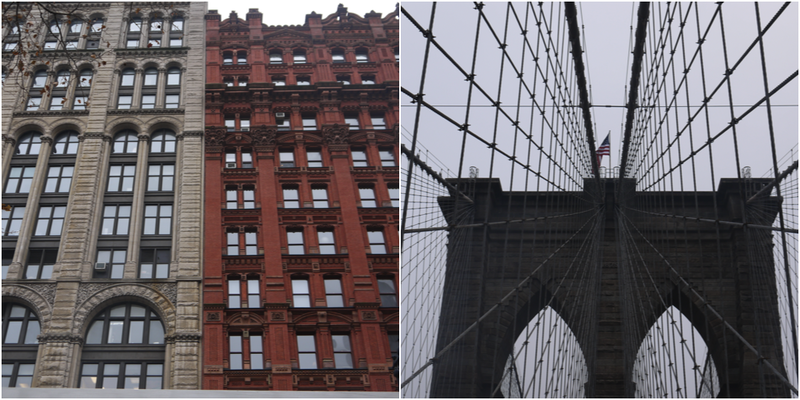 I honestly do love New York. We stayed in the Financial District at Holiday Inn Wall St for 5 nights. We got a sweet deal on Hotwire with a secret room, I would definitely recommend that. My little brother was staying with us, so it was cosy but awesome value. We caught the subway and walked a lot. 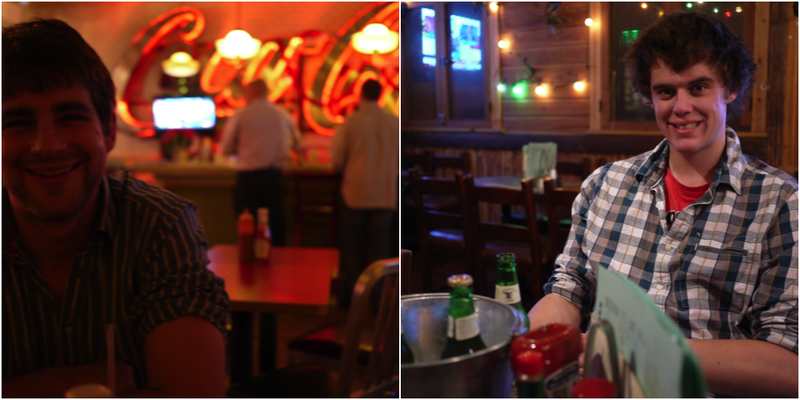 Every night around 5pm we were exhausted and found ourselves in a random drinking establishment, resting our feet until a beer or two boosted our second wind. It was early December which turned out to be a perfect time to visit. 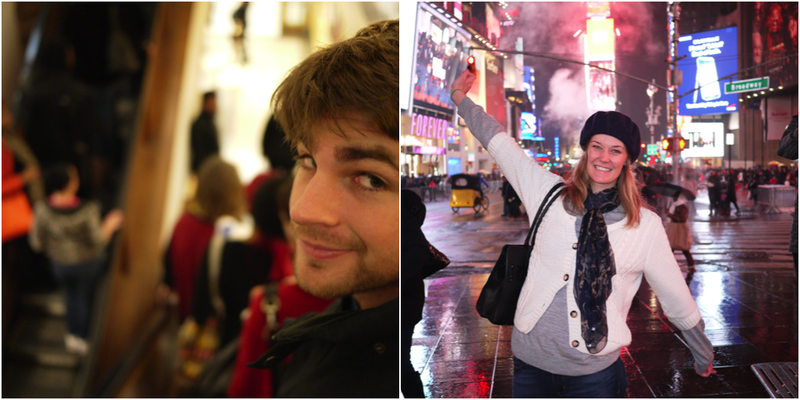 The weather was mild, the crowds were virtually non-existent and the holiday season was well and truly there. O'Hara's Mum sent us a New York Pass for 3 days, which meant we could pretty much do everything pre-paid! Thanks Mumma and Pappa O'Hara! Black and White Picasso exhibition at the Guggenheim - I LOVE Picasso. O'Hara learns to love it after spending a while walking around. Ask him today though and he'll probably say he doesn't. Little Italy - Obsessed. The food, the decorations, the feel. We came here on our first night for dinner, ate at the original Vince's Restaurant. Had the best tomato pasta sauce ever (sorry Dad). We took Jonathan there on our last night for dessert. Win. 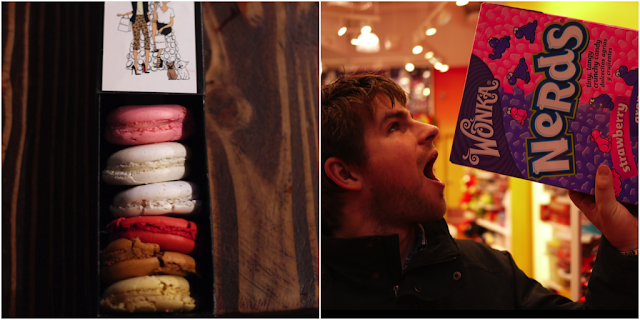 Paella, sangria and churros con chocolate - We'd been on the hunt for churros con chocolate for months. Socarrat Paella Bar delivered. Jazz, wine and martinis - We went to the Village Vanguard for Monday night Jazz. We realised we were on a good thing when we met someone out the front who had been coming to the bar since he was 17. He is now 68. I love how Jazz has the ability to completely transport you to a different time. We felt like we were in the 50's drinking red wine and martinis and listening to Jazz in a club underground. It was wonderful. 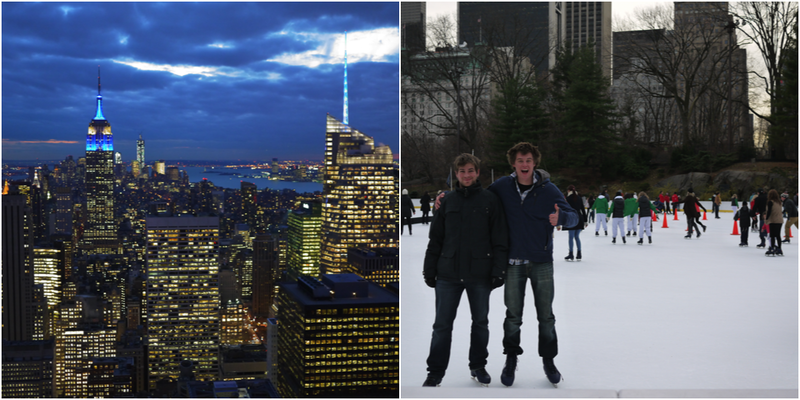 Central Park, Christmas markets and ice skating - Is Central Park the coolest place ever? Possibly. We seemed to end up walking through there at least once a day. The Christmas markets were on while we were there. Hot chocolate, truffles, hot apple cider, bratwurst, macarons and pretty things. Perfect. 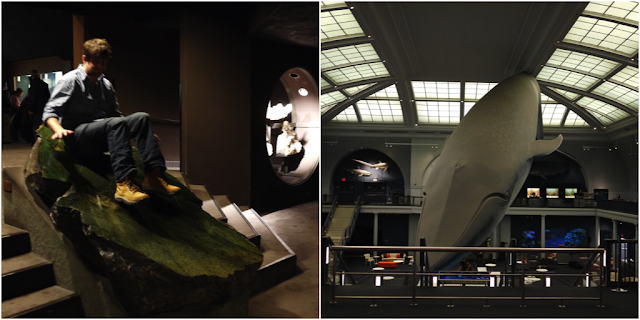 American Museum of Natural History - We saw the whale that Barney knocked down. This museum was huge! Times Square - at night, during the day, it doesn't even matter. Catching up with Matt and Mim - Drinks with friends. Impossible to go wrong. It was fantastic to see these guys after so long. O'Hara and Jonathan hit the 10% beers, which ended about as well as you'd expect. 5th Avenue - Jonathan and O'Hara were hugely hungover, guess from when? 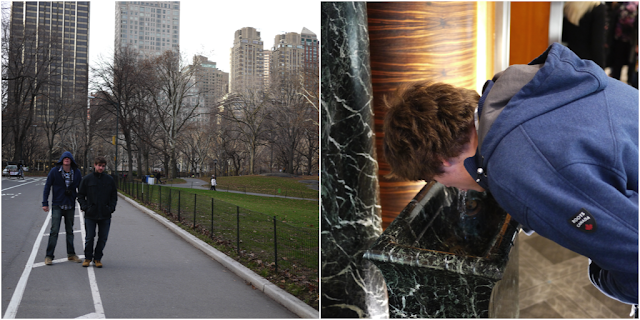 They managed a quick wander through Tiffany and Co and found the lovely granite drinking fountain. Classy. Water Taxi - it was slightly chilly, but not too much that we couldn't sit up and watch the Statue of Liberty. She's beautiful. Unfortunately you couldn't go up inside her head because of Sandy, her island needed some repair. We also caught the ferry across to Brooklyn and had delicious pizza. 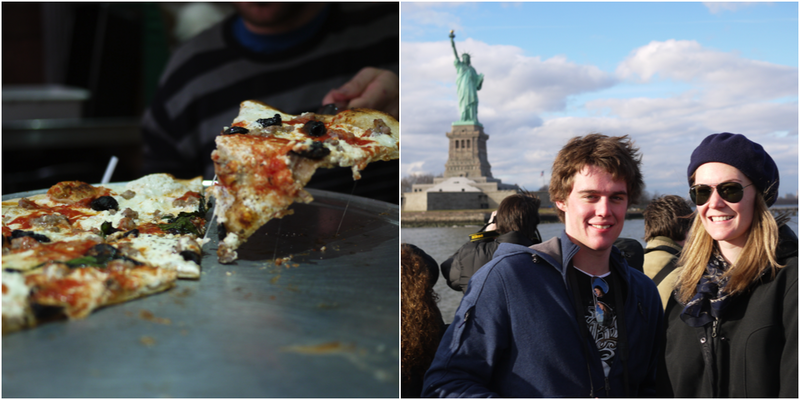 It may have been a tourist trap, but it didn't matter because the pizza was worth it. Wall Street - We wanted to go inside the NYSE but didn't work that out. O'Hara and Jonathan got up close and personal with the bull. It was packed with people wanting to rub it's balls. A bit like the big marino I think. Strange! Ground Zero and Freedom Tower - Ground Zero was emotional, Freedom Tower is impressive. It's so sad looking at the Manhattan skyline, never having seen the Twin Towers. The Freedom Tower is an impressive skyscraper. It'll be amazing when completed. Empire State Building - We only splashed around the lobby, and instead went up the Rock. It meant we could see the Empire State Building from the sky. Awesome! All the pubs - We went to some cute little drinking establishments. It made me miss living in a bigger city. Our only major fail was catching the train back to New York after Boston, rather than just flying straight to Toronto. I think we got confused when deciding where we were going and how to get to Fredericton. However it happened, it cost us an extra day and a half and around $300.... oops. At least we got a nice scenic train ride. Can I please move to the New England coast. So beautiful! We really had the best time there. A holiday where major highlights are eating and drinking is always going to be brilliant, New York seemed to bring everything we needed in a city. Take me back!